Before I begin, let me state for all the world to see that I WILL NEVER AGAIN GO TRAIN RIDING ON A HOLIDAY WEEKEND! With that out of the way, here are the details of a miss-guided attempt to show some newbies that train riding is all fun and no pain... The way I understand it, two Belgian journalists - Jan (a writer) and Stephan (a photographer), wanted to do a magazine article on American hoboes. 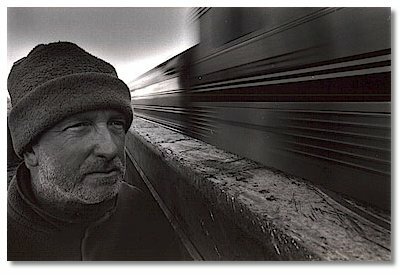 After reading Ted Conover's excellent book, Rolling Nowhere, they got in touch with the author for help in hooking up with someone in the States to "guide" them through the process of acquiring rudimentary train hopping skills to enable them to travel throughout the Northwest in search of material for their story. Ted Conover, having read an article about hoboes in the San Francisco Chronicle that mentioned my name, suggested that they try to get in touch with me. Further probing, after reading Daniel Leen's pioneering opus The Freighthopper's Manual For North America: Hoboing In The 21st Century, got them my address from the author, and in the next few weeks, through both snail- and e-mail, we were able to come up with a rather open-ended plan to meet in Eugene, OR on Saturday morning and wing it from there - they had two weeks "in country" and I was to ride with them the first few days to answer any questions they might have, etc. In order for me to get to their motel room bright and early on Saturday morning, I would have to make sure I got into Eugene the night before, which meant catching out of Dunsmuir sometime Friday morning. My enthusiasm for another train trip got the best of me and I went out to Black Butte the night before, so that Shelley wouldn't have to drive me to the yard before work on Friday. As luck would have it, there was a northbound train on the main picking up some cars off the siding, one of which was a nice wooden-floored boxcar with both doors open. I climbed aboard and was off to Eugene within a half-hour. After sleeping right through Klamath I woke up just east of the Cascade summit to take a leak - leaving my "moniker" in the fresh snow. The ride down the hill was fast and smooth, and I bailed off near downtown Eugene at 7:00 am the next morning, only in my haste to get underway, it was 7:00 am on Friday morning, and I was suddenly faced with an entire day to kill in town before we would leave. The brilliant idea of securing a cheap motel room as a base of operations was seized upon, but, not having the actual credit card (Shelley had it), only knowing the number and expiration date, prevented me from getting a room at the first five motels I stopped at. After starting my quest in the "$26.95 a night" dives on the edge of town, I was now at the fringe of downtown itself, and it was at the "$40 a night" zone that I was allowed to rent a room. 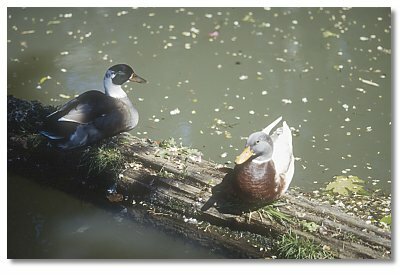 I spent the day wandering around town checking out the Sallies and used book stores, then retired to my room with a bottle of wine to groove on the 1,000's of channels on TV and feed the tame ducks (photo at left) in a canal behind the motel. After a good sleep on a surprisingly comfortable bed, I walked the 6 blocks or so to the motel where I was to meet the Belgians, gloating to myself that I knocked on their door at 8:00 am, precisely the pre-arranged time. After a hearty greeting I was told that the airline had "miss-routed" their packs, and we ended up spending most of Saturday sitting around their motel room, talking about train riding and waiting for the luggage to show up. It finally arrived just before 4:00 pm, and we quickly summoned a cab and were off for the freightyard. 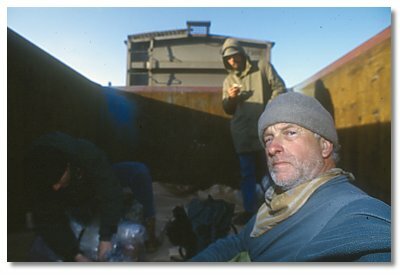 When we got to the yard a couple of tramps sitting in a boxcar on a string of cars headed north were amused to see 3 more erstwhile travelers falling out of a cab with all manner of packs, grips, sleeping pads and other accouterments. Spotting a southbound string with the power already hooked up on the drive over to the yard, we climbed over a few strings and found a gondola that had a small amount of ballast left on the floor - it would have to do. The minute the last of our merry band climbed into the car we were greeted with a mighty jerk and away we went. I should have sensed that something was wrong because I didn't have to wait my usual 4 or 5 hours to catch out, but we kicked back and began to enjoy the ride up the western foothills of the Cascades (photo at left), knowing that there would be plenty of sunlight left when we got near the summit. Unfortunately, about 25 miles east of Eugene, we went into a siding and they dropped the air. Thinking they were just cutting some helpers behind us, I wasn't too concerned, but then I realized that we hadn't passed any on the way up, so I quickly turned on the scanner and heard the dispatcher telling the crew to pick up the "telly" and return to Eugene. As the engines passed us heading back downhill I hollered to get their attention and the brakeman pointed to the ground, confirming my fears that we were being parked there until possibly Tuesday because of the Memorial Day holiday on Monday, and here it was only Saturday afternoon. Well, we didn't exactly get up and dance a jig when we heard this, but, on the plus side (if there was one), we had a big lake on one side and a highway and small store on the other, so we bought some beer and tried to make the best of it. Later that evening we met Tall Man (at left in photo, courtesy of Stephan Vanfleteren) walking up from the back of our train. 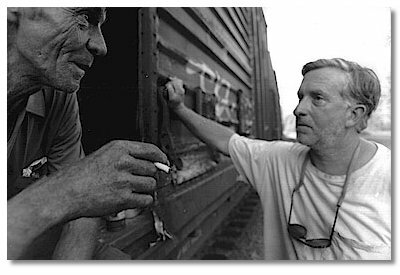 I knew him from riding through Dunsmuir a million times and we now had four inebriated strandees sitting in the door of a boxcar, enjoying the Oregon twilight. We had a good sleep in the boxcar that night, but it certainly wasn't helped by hearing 4 more southbounds fly by a few feet away. Oh well, maybe they'll pick us up today and we'll be able to continue on our trip... Arising early, we began to hitchhike - Tall Man headed east to Chemult where he might be able to catch a BN man down to Klamath, and the three of us back to Eugene to start all over again. 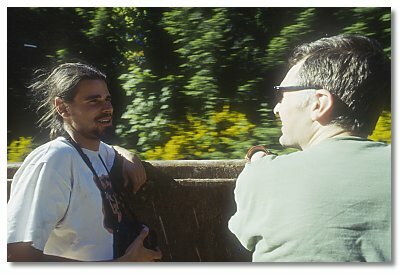 I soon remembered why I hate to hitchhike - after almost 5 hours of working a "Eugene" sign, we gave up and decided to start walking the 25 miles back to Eugene. If we could get back to the couple of sidings east of Springfield we might be able to catch a train stopped to add helpers, cuz nobody was going to be stopping at "our" siding with it blocked by our train. After going only 2 or 3 miles down the highway with the world's narrowest shoulder, we miraculously got a ride in a pickup that dropped us off near Interstate 5, where we walked another couple of miles to a bus stop, but since we didn't know if the bus would be running (it was now Sunday, and the schedule wasn't posted), we set off on yet another walk towards town, and soon we found a kid who drove us to the freightyard for gas money. With soaring spirits and sore feet, we again plunged into the depths of the yard, but our luck wasn't quite as good as the day before. We ended up sitting around the yard for almost 12 hours - from 2:00 pm in the afternoon until around 1:00 am before we left town on yet another gondola, this one having carried scrap metal at one time. By cutting up some air bags and spreading them out along with a couple of humongous pieces of cardboard, we were able to pad our domicile without having to scrape away too much of the crap on the floor, which, I've learned from experience, loosens up the dust layer so that when the train is moving it's suddenly bandana time for the whole trip. Since our previous trip lasted only an hour or so out of Eugene, I was naturally a little "edgy" for the first hour or two on this one. Getting dropped off again would have severely taxed any confidence I might have had left for ever getting over the mountains in my lifetime, and when we stopped in roughly the same area as last time, I leapt from my sleeping bag in a shot. It was 3:00 am, we were in a fir covered canyon, and, as Jan noted almost immediately, there were frogs croaking - exactly like the day before! The only thing that prevented me from having a heart attack was that I recognized we were in Oakridge, and the sound of units idling behind us told me that we were just cutting in the helpers. A bigger sigh of relief was never felt. I was now able to drift off to sleep somewhat comforted by our present status, and the rest of the ride was uneventful. The Belgians woke up before dawn near Chemult and I tried to sleep at least until the sun came up, but a clear day and Amtrak roaring by brought me out of my bag and into a 36 degree morning (photo at left, courtesy of Stephan Vanfleteren). We got into Klamath around 8:00 am and our train was tied down in the yard. The crew bus driver told us that the train wouldn't leave until noon or so, and we headed to Gino's market for coffee and breakfast. Jan and Stephan decided to spend the day talking to whatever tramps they could find in the yard, then head over to the BN yard to catch the Pasco man that night. I was going to wait for the train we came in on to leave and ride it down to Black Butte or Dunsmuir. We all spent the rest of the morning hanging out in the yard, talking with tramps, chatting with Roger, and going over train maps. Around 2:00 or 3:00 pm my train left and I climbed back into our trusty gondola and waved goodbye to the Belgians, hoping their luck would improve once the holiday was over. I had a nice but dusty ride south, bailing off near Mt. Shasta and walking into town to call Shelley for a ride home.